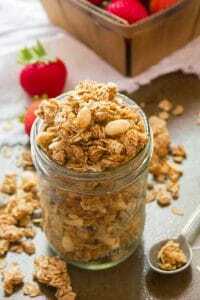 This crunchy and highly addictive peanut butter granola is made with crunchy toasted oats, creamy peanut butter and is studded with sweet dates. Delicious as a sweet snack or as part of an easy breakfast! When I was a kid, believe it or not, I wasn’t a very big fan of peanut butter and jelly sandwiches. I mean, I thought they were okay and all, but I pretty much had a take it or leave it attitude towards what most Americans view as a classic kid-treat. What I didn’t realize was that the part of the sandwich that was turning me off was the jelly. I’m still not into grape jelly. I can get down with some marmalade or berry preserves, but grape jelly just tastes like a big old mouthful of squishy sugar to me. These days I’m all about peanut butter, and have been known to keep an excessive number of jars on hand. So, of course peanut butter granola was inevitable. I’ve been holding back for a while, and I did a few trials with this recipe, as I had to get it absolutely perfect. I succeeded. This stuff tastes like a peanut butter cookie with a hint of maple. Restraint will be needed. 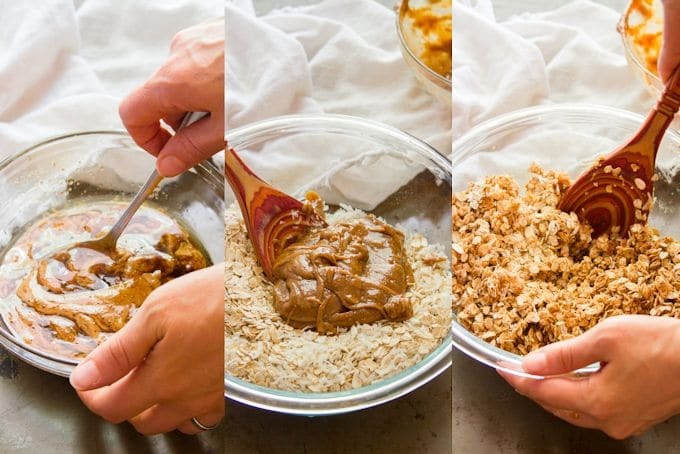 To make your peanut butter granola, start by mixing up the wet ingredients: peanut butter, maple syrup, oil and vanilla. Dry ingredients go into a separate bowl: oats, sugar, coconut, and salt. Combine the wet and dry ingredients, then arrange the mixture on a baking sheet, and bake until crisp! Dates and peanuts get added at the end. Should you stir the granola during baking? Nope! Or at least, not unless you like super crumbly granola. Leave it be and it’ll bake up in nice chunky clusters. 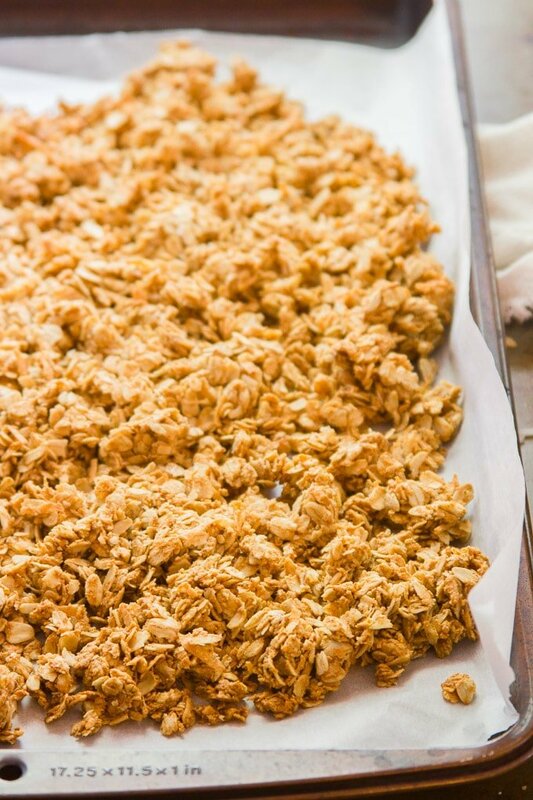 And on that note, pack your granola down when you arrange it on the baking sheet. This will encourage cluster formation. I highly recommend using creamy, natural (runny) peanut butter for this recipe. Trader Joe’s brand is my favorite. Your granola should stay nice and crisp in a sealed bag or container for about two weeks. 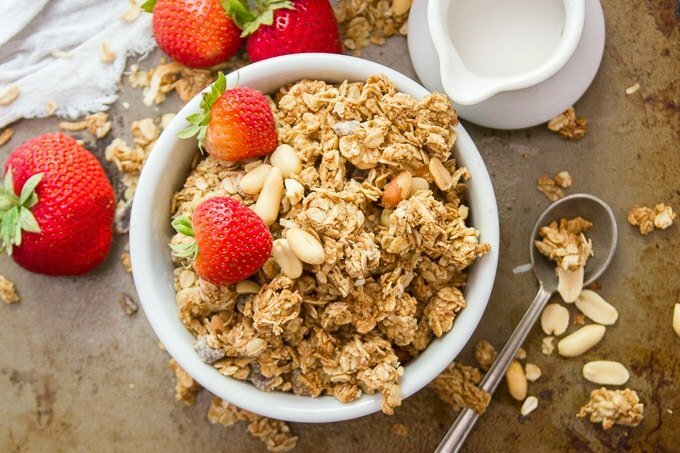 Use certified gluten-free oats if you’d like to keep your granola gluten-free. Preheat the oven to 300° and line a baking sheet with parchment paper. Mix the oats, coconut, sugar, and salt together in a large bowl. Mix the peanut butter, maple syrup, oil, and vanilla together in a medium mixing bowl. Add the peanut butter mixture to the oat mixture and stir until thoroughly incorporated. Spread the mixture in an even layer on the prepared baking sheet, pressing it down a bit to compact it. Bake for 30-35 minutes, until browned around the edges. Remove the baking sheet from the oven and place it on a cooling rack. Allow the granola to cool completely. When the granola is cool, transfer it to a container and stir in the peanuts and dates. Thanks Caitlin! It was so good – enjoy!!! I decided I needed a break from my go-to granola recipe, so gave this one a try. Omg, soooooo good! I added roasted almonds instead of peanuts at the end, and topped my bowl with some toasted cocoa nibs, but otherwise stayed true to the recipe. This stuff is almost TOO good! Yay!! 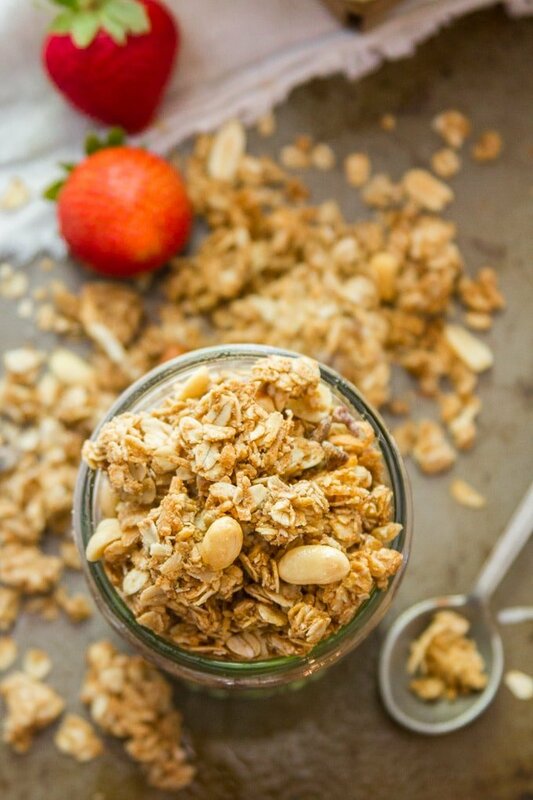 I’ve had a couple of your granola recipes bookmarked forever, by the way – ha! So I’ll have to give yours a try soon. I’m glad you enjoyed this. Thanks Katie!